These days it’s hard to find something unique, beautiful and affordable. I would highly recommend personalized chopsticks which are everything and practical since most of us eat sushi or order Chinese take-out every now and then. It was a wonderful experience for me to give my best friend, Yoko, a dozen pairs of personalized chopsticks for her bridal shower. Yoko and her family absolutely love them! 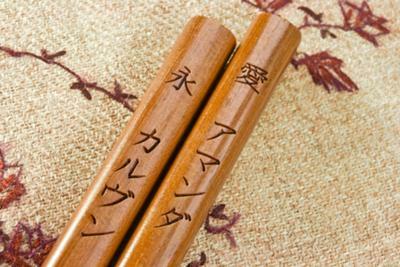 I’d had the chopsticks engraved with Yoko and her husband’s name in Japanese and also added two Asian character symbols, “Love” and “Eternity”, at the top of the chopsticks. It looked amazing! My friend has since been finding her chopsticks (my bridal shower gift) very useful in her new love nest. Join in and write your own page! It's easy to do. How? Simply click here to return to Bridal Shower Gift Idea.